Hi all, several of you have asked what has happened to Babo and his adventures lately, and both Mireille and myself had been holding off on answering any of you in the hope that we would have good news to share. Unfortunately we have the task of letting you all know that Babo has gone AWOL since the end of March, the last sighting of him was via the motion sensitive CCTV system in our kitchen during late morning on the 30th March. 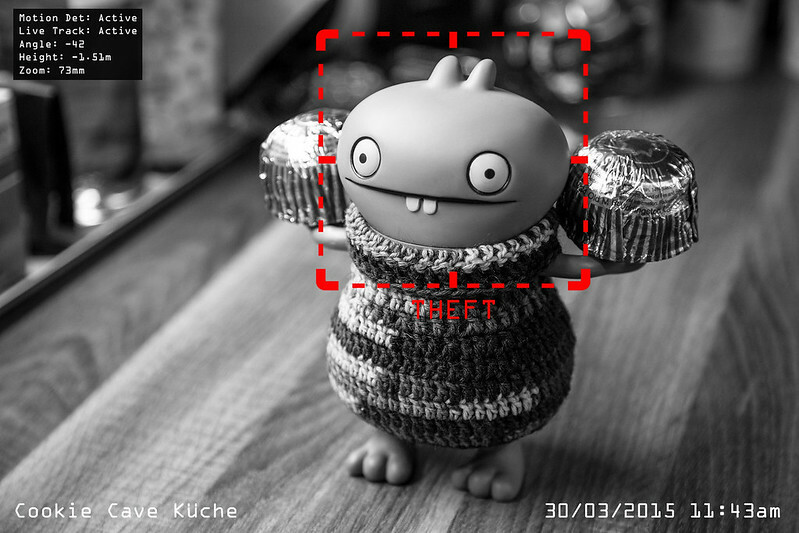 As you can see, our system picked up Babo absconding with a pair of unauthorised Tunnocks Teacakes. Sadly, since that sighting, even with out mammoth efforts to find the little guy, he's nowhere to be found. There's all kinds of rumours floating around the cookie cave, almost all of which revolve around him running off with Katy Perry, with a few side options being that he developed amnesia and forgot where he lived, but sadly we have no way of knowing for sure where he's gone. If any of you see him on your travels, do your best to set him back on his path home to the cookie cave, where there's a huge pile of cookies waiting with his name on them, for now I guess his 365 is on hold.